The elbow complex consists of the distal humerus and proximal ulna and radius forming the humeroulna, humeroradial, and proximal radioulnar joints. The distal humerus includes the lateral capitellum, the medial trochlea, the posterior olecranon fossa, and anterior coronoid fossa. Pediatric population predisposed, especially during ages when the supracondylar bone is undergoing skeletal maturation and has a thin and weak cortex. Fractures are classified as either an extension- or flexion-type fracture. The majority of supracondylar humeral fractures are extension-type fractures (97-99%) resulting from a fall on outstretched hand with the elbow in full extension. The forced elbow hyperextension stresses the distal humerus with the olecranon acting as a fulcrum while the anterior elbow joint capsule produces an anterior tensile load, resulting in fracture and disruption of anterior periosteum. Posterior periosteum may or may not remain intact. A small number are classified as flexion-type fractures caused by a direct blunt trauma with the elbow in a flexed position. Radiographs should include true AP of distal humerus (not elbow) and true lateral elbow views. If signs of osseous injury (fat pad sign) present the following 2 parameters used to assess for supracondylar fracture. Closed reduction and pin fixation is the most common treatment and is the indicated initial treatment for nearly all displaced closed fractures. 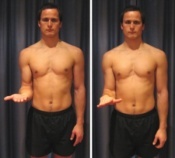 Criteria for successful reduction include Braumann angle >10 degrees, intact medial and lateral columns, and anterior humeral line through middle third of capitellum. Kirschner wires are commonly used to hold reduced fracture and arm is immobilized (between 40-60 degrees flexion). With failed closed reduction, open fractures, and limb vascular compromise open reduction is the indicated treatment method. Anterior or lateral approach may be used, while posterior approach is not recommended due to significant rates of limited motion and osteonecrosis of trochlea. In-hospital traction is no longer a commonly used treatment technique given the outcomes and minimal hospital stay with closed reduction. The following exercises are commonly prescribed to patients with a supracondylar fracture following confirmation that the fracture has healed, and that the orthopaedic specialist has indicated it is safe to begin mobilization. You should discuss the suitability of these exercises with your physiotherapist prior to beginning them. Generally, they should be performed 3 times daily and only provided they do not cause or increase symptoms. ↑ 1.0 1.1 Brubacher JW, Dodds SD. Pediatric supracondylar fractures of the distal humerus. Curr Rev Musculoskelet Med 2008;1:190-196. ↑ 2.0 2.1 2.2 2.3 2.4 2.5 2.6 2.7 2.8 Omid R, Choi PD, Skaggs DL. Supracondylar humeral fractures in children. J Bone Joint Surg Am 2008;90:1121-32.